HYATTSVILLE, Md. (CNS) — A week after the mosque shootings in Christchurch, New Zealand, and almost 9,000 miles away from this tragedy, Catholic school students in Maryland gathered to pray for the victims and to recommit themselves to ending hate. 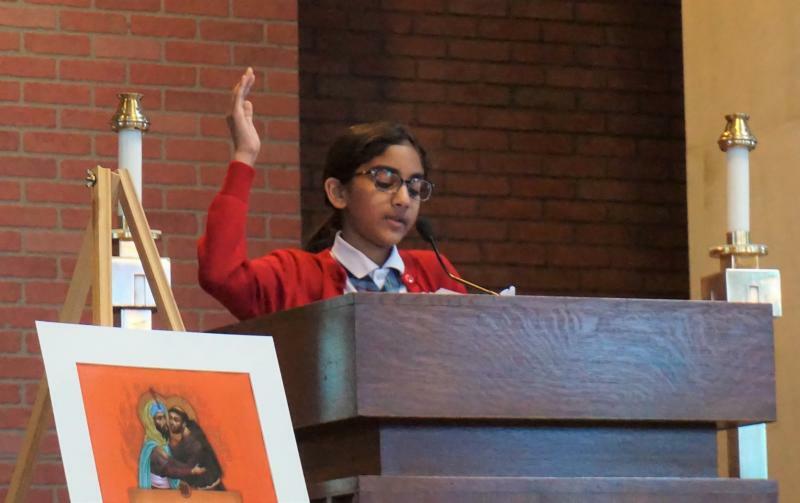 The St. Francis International School students were reminded March 22 that the previous week’s shootings that killed 50 people took place “on the other side of the world” and even though they probably do not know anyone impacted, it was important to both pray and take action to prevent the hatred that has led to recent mass shootings. One speaker told the students she prayed they wouldn’t need another prayer service like this. MJ Park, the founder of Little Friends for Peace, a Maryland group that runs a peace camp and offers peace curriculum for schools, told the students about Pope Francis’ recent journey to the United Arab Emirates and the document “Human Fraternity for World Peace” that he signed with leading imams and scholars. Franciscan Father Jacek Orzechowski, director of parish community organizing and advocacy with Catholic Charities of the Archdiocese of Washington, spoke to the students about something not so recent: St. Francis of Assisi’s dialogue with the sultan of Egypt in the Holy Land 800 years ago during the Crusades, a series of religious wars between Christians and Muslims. “Francis worked for peace; you can too,” he told them. “We can make steps” for good, she stressed, even in midst of horrific events. One step the St. Francis students have already made is their participation in the Anti-Defamation League’s “No Place for Hate” movement. Kampia said the school had received a certificate for its participation, but it would be an ongoing process to combat hate — something that students would have to consider in their words and jokes that could have an impact. He told the students the motivation behind the mosque shooter’s action can be found in the 74-page manifesto he sent out, but it all boils down to one word: hate. “He hated people because he didn’t understand them, and the prejudice and bias in his heart was enough to make him shoot people he hadn’t even met,” the school official said. School students recited prayers based on Islam’s “99 Names of Allah” and St. Francis’ “Praises of God” along with modern prayers for peace written by the students.